As energy technology advances, West Coast Solar believes renewable energy sources are the future of energy consumption. Whether you utilize solar, wind, hydro, geothermal, or biomass, you’re creating a better future for your loved ones, the community, and the planet. Go green with renewable energy and do more than save money on your utility bills. You can help save the environment, become energy independent, and create a better future for those around you. In this blog series, we’re discussing the relationships between smart grids and smart homes, appliances, consumers, and renewable energy production systems. We’ll also discuss how important it is for consumers to interact with their energy consumption through smart technologies and data. This consumer engagement will lead to better, smarter energy consumption decisions that affect the entire planet. There has never been a better way to act locally and think globally than with renewable energy. Are you ready to make the switch to renewable energy? Give West Coast Solar a call today and discuss installing a solar power system on your home or business. We’ve been serving Sacramento, San Jose, and the surrounding areas in California for years. Otherwise, continue reading to learn more about smart grids and consumer energy engagement. What is consumer energy engagement? 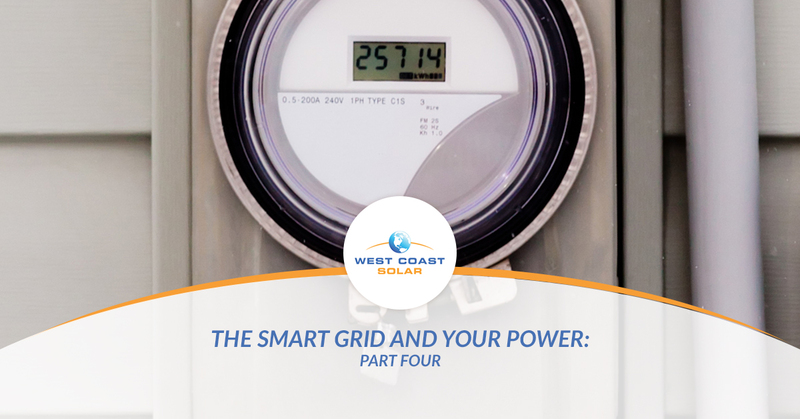 If you’re a smart consumer of energy, you will surely ask, “What’s in the smart grid, home, appliances, and renewable energy for me?” At West Coast Solar, we’re excited to tell you that there’s more to renewable energy than saving money on your utility bills. You will become energy independent, reduce home carbon emission substantially, and create a better future for your community when you go green with your energy consumption. Whether you choose to upgrade to home automation or install a solar energy system on your home, you can make a difference in your pocketbook and in the community. When we talk about consumer engagement, it means the homeowner or business owner will have more control over their energy use down to the kilowatt used per hour. Smart grids, homes, appliances, and more offer opportunities to create energy efficiency, effectiveness, and reliability. The engagement you can have between your home, solar system, and the grid increases exponentially, which fosters more awareness and responsibility around energy consumption. Granted, you may need to wait until the early morning or evening to do laundry, but it’s worth the money you’re saving and the positive effect on the environment. How does a smart grid affect consumer energy use? A smart grid, once available in your area, offers time-of-use programs. Throughout the day, the consumption of energy and the cost of energy fluctuates. In most cases, the highest use and cost of energy is between noon and 9 p.m. This means that if you have your air conditioner, laundry machine, dishwasher, and all the lights on in the house between these hours, you’ll be paying a premium for your energy. Along with the increase in use and cost of energy, the grid has to deliver a larger amount of consistent energy to meet the needs of the consumers, which taxes the system, creating more pollution, a higher chance for power outages, and a higher cost per kilowatt. A time-of-use program shares the prices of energy during non-peak hours and encourages you to consume energy outside of the regular peak hours. This decreases pollution, spreads out energy demand on the system, and saves you money on your utility costs. If you install your own renewable energy production system, you can take advantage of net metering programs through your utility company. In some areas, net metering is offered even though a smart grid is not implemented. However, net metering can work with smart grids, and, in most ways, it’s better to use net metering with a smart grid. Nonetheless, if you have a solar power system installed on your home, you produce your own energy. Do you know what to do with any excess energy? You can either store it in a home battery bank or “sell” it to the grid through your utility company. If you send the excess energy to the grid, you will gain a credit on your utility bills for when you do use energy through your utility company. A smart grid can enable the cost of consumer-generated power based on time sent to grid and amount of energy sent. This simply means that if you produce energy with your solar energy system and send it to the grid during peak hours, you can make more than if you sent it in the middle of the night. Why is it important to keep up with energy interactions? A smart grid, home, renewable energy system, and consumer engagement creates a safer, more reliable, and more environmentally conscious and responsible energy network. The smart grid allows for homeowners to make better choices when it comes to energy consumption. A smart home provides data on usage and efficiency, and a renewable energy system, like solar, creates energy independence. As renewable energy technology continues to advance, it’s becoming more apparent that there is an alternative to fossil fuel energy production. Solar, wind, hydro, geothermal, and biomass all present environmentally friendly energy production options. When consumers stay engaged with their energy use, it offers numerous benefits to the consumer and the community. Choose renewable energy to power your life! Smart grids and consumer engagement are vital to increasing energy consumption efficiency, effectiveness, and reliability. The more the consumer and the grid communicate on multiple levels, the better the entire energy network can become. At West Coast Solar, we believe in the future of renewable energy, and we’re committed to making the use of solar energy a global standard. Want to discuss installing solar panels on your property? Give us a call today!